The Idaho P.E.O. 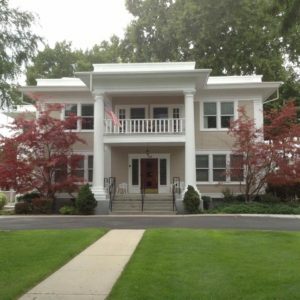 Chapter House has provided an elegant home for independent senior living since 1951. As one of the oldest Chapter Houses in the nation, they offer stability, well maintained buildings and grounds, and a caring staff for up to eighteen residents. The Idaho Chapter House in Caldwell began as an idea from the 1936 convention and a gift of $100 from Love Miller Smith, Chapter F. This initial gift grew into a 5 year plan at the 1947 convention for each chapter in Idaho to pay an amount proportionate to the size of their chapter. In 1950 the Caldwell Sanitarium and related property was offered for a Chapter House with the stipulation that the P.E.O.’s raise $21,000. By June 1949, the fund had grown to $19,000. Special fund drives brought the remainder needed. The Chapter House is on the National Register of Historic places. Since that time several cottages have been added, apartments in the main house have been improved, old outdated items have been replaced, windows are being updated, central air is being installed & the grounds continue to be maintained and improved. Donations and gifts continue to increase each year. Good management and staff care for the residents and their surroundings. The house is available for luncheons & meetings at minimal costs.